Until Washington deals with Afghanistan’s economic dependence on opium, the Taliban aren’t going anywhere. After fighting the longest war in its history, the United States stands at the brink of defeat in Afghanistan. How can this be possible? How could the world’s sole superpower have battled continuously for fifteen years, deploying 100,000 of its finest troops, sacrificing the lives of 2,200 of those soldiers, spending more than a trillion dollars on its military operations, lavishing a record hundred billion more on “nation-building” and “reconstruction,” helping raise, fund, equip, and train an army of 350,000 Afghan allies, and still not be able to pacify one of the world’s most impoverished nations? So dismal is the prospect for stability in Afghanistan in 2016 that the Obama White House has recently cancelled a planned further withdrawal of its forces and will leave an estimated 10,000 troops in the country indefinitely. Were you to cut through the Gordian knot of complexity that is the Afghan War, you would find that in the American failure there lies the greatest policy paradox of the century: Washington’s massive military juggernaut has been stopped dead in its steel tracks by a pink flower, the opium poppy. For more than three decades in Afghanistan, Washington’s military operations have succeeded only when they fit reasonably comfortably into Central Asia’s illicit traffic in opium, and suffered when they failed to complement it. The first US intervention there began in 1979. It succeeded in part because the surrogate war the CIA launched to expel the Soviets from that country coincided with the way its Afghan allies used the country’s swelling drug traffic to sustain their decade-long struggle. On the other hand, in the almost fifteen years of continuous combat since the US invasion of 2001, pacification efforts have failed to curtail the Taliban insurgency largely because the United States could not control the swelling surplus from the county’s heroin trade. As opium production surged from a minimal 180 tons to a monumental 8,200 in the first five years of US occupation, Afghanistan’s soil seemed to have been sown with the dragon’s teeth of ancient Greek myth. Every poppy harvest yielded a new crop of teenaged fighters for the Taliban’s growing guerrilla army. At each stage in Afghanistan’s tragic, tumultuous history over the past 40 years—the covert war of the 1980s, the civil war of the 1990s, and the US occupation since 2001—opium played a surprisingly significant role in shaping the country’s destiny. In one of history’s bitter twists of fate, the way Afghanistan’s unique ecology converged with American military technology transformed this remote, landlocked nation into the world’s first true narco-state—a country where illicit drugs dominate the economy, define political choices, and determine the fate of foreign interventions. The CIA’s secret war against the Soviet occupation of Afghanistan during the 1980s helped transform the lawless Afghan-Pakistani borderlands into the seedbed for a sustained expansion of the global heroin trade. “In the tribal area,” the State Department would report in 1986, “there is no police force. There are no courts. There is no taxation. No weapon is illegal… Hashish and opium are often on display.” By then, the process had long been underway. Instead of forming its own coalition of resistance leaders, the Agency relied on Pakistan’s crucial Inter Service Intelligence (ISI) and its Afghan clients who soon became principals in the burgeoning cross-border opium traffic. Once the mujahedeen fighters brought the opium across the border, they sold it to Pakistani heroin refiners operating in the country’s North-West Frontier Province, a covert-war zone administered by the CIA’s close ally General Fazle Haq. By 1988, there were an estimated 100 to 200 heroin refineries in the province’s Khyber district alone. Further south in the Koh-i-Soltan district of Baluchistan Province, Gulbuddin Hekmatyar, the CIA’s favored Afghan asset, controlled six refineries that processed much of the opium harvest from the Helmand Valley into heroin. Trucks of the Pakistani army’s National Logistics Cell, arriving in these borderlands from the port of Karachi with crates of weaponry from the CIA, left with cargos of heroin for ports and airports where it would be exported to world markets. Over the longer term, such a “clandestine” intervention (so openly written and bragged about) produced a black hole of geopolitical instability never sealed or healed thereafter. Lying at the northern reaches of the seasonal monsoon, where rain clouds arrive already squeezed dry, arid Afghanistan never recovered from the unprecedented devastation it suffered in the years of the first American intervention. Other than irrigated areas like the Helmand Valley, the country’s semi-arid highlands were already a fragile ecosystem straining to sustain sizable populations when war first broke out in 1979. As that war wound down between 1989 and 1992, the Washington-led alliance essentially abandoned the country, failing either to sponsor a peace settlement or finance reconstruction. Washington simply turned elsewhere as a vicious civil war broke out in a country with 1.5 million dead, three million refugees, a ravaged economy, and a bevy of well-armed warlords primed to fight for power. During the years of vicious civil strife that followed, Afghan farmers raised the only crop that ensured instant profits, the opium poppy. The opium harvest, having multiplied twentyfold to 2,000 tons during the covert-war era of the 1980s, would double during the civil war of the 1990s. In this period of turmoil, opium’s ascent should be seen as a response to the severe damage two decades of warfare had inflicted. With the return of those 3 million refugees to a war-ravaged land, the opium fields were an employment godsend, since they required nine times as many laborers to cultivate as wheat, the country’s traditional staple. In addition, opium merchants alone were capable of accumulating capital rapidly enough to be able to provide much-needed cash advances to poor poppy farmers that equaled more than half their annual income. That credit would prove critical to the survival of many poor villagers. In the civil war’s first phase from 1992 to 1994, ruthless local warlords combined arms and opium in a countrywide struggle for power. Determined to install its Pashtun allies in Kabul, the Afghan capital, Pakistan worked through the ISI to deliver arms and funds to its chief client Hekmatyar. By now, he was the nominal prime minister of a fractious coalition whose troops would spend two years shelling and rocketing Kabul in fighting that left the city in ruins and some 50,000 more Afghans dead. When he nonetheless failed to take the capital, Pakistan threw its backing behind a newly arisen Pashtun force, the Taliban, a fundamentalist movement that had emerged from militant Islamic schools. After seizing Kabul in 1996 and taking control of much of the country, the Taliban regime encouraged local opium cultivation, offering government protection to the export trade and collecting much needed taxes on both the opium produced and the heroin manufactured from it. UN opium surveys showed that, during their first three years in power, the Taliban raised the country’s opium crop to 4,600 tons, or 75 percent percent of world production at that moment. In July 2000, however, as a devastating drought entered its second year and mass starvation spread across Afghanistan, the Taliban government suddenly ordered a ban on all opium cultivation in an apparent appeal for international recognition and aid. A subsequent UN crop survey of 10,030 villages found that this prohibition had reduced the harvest by 94 percent to a mere 185 tons. After a decade of ignoring Afghanistan, Washington rediscovered the place with a vengeance in the aftermath of the 9/11 attacks. Only weeks later, in October 2001, the Unietd States began bombing the country and then launched an “invasion” spearheaded by local warlords. The Taliban regime collapsed, in the words of veteran New York Times reporter R.W. Apple, with a speed “so sudden and so unexpected that government officials and commentators on strategy…are finding it hard to explain.” Although the US air attacks did considerable physical and psychological damage, many other societies have withstood far more massive bombardments without collapsing in this fashion. In retrospect, it seems likely that the opium prohibition had economically eviscerated the Taliban, leaving its theocracy a hollow shell that shattered with the first American bombs. To an extent not generally appreciated, for the previous two decades Afghanistan had devoted a growing share of its resources—capital, land, water, and labor—to the production of opium and heroin. By the time the Taliban outlawed cultivation, the country had become, agriculturally, little more than an opium mono-crop. The drug trade accounted for most of its tax revenues, almost all its export income, and much of its employment. In this context, opium eradication proved to be an act of economic suicide that brought an already weakened society to the brink of collapse. Indeed, a 2001 UN survey found that the ban had “resulted in a severe loss of income for an estimated 3.3 million people,” 15 percent of the population, including 80,000 farmers, 480,000 itinerant laborers, and their millions of dependents. While the US bombing campaign raged throughout October 2001, the CIA spent $70 million “in direct cash outlays on the ground” to mobilize its old coalition of tribal warlords to take down the Taliban, an expenditure President George W. Bush would later hail as one of history’s biggest “bargains.” To capture Kabul and other key cities, the CIA put its money behind the leaders of the Northern Alliance, which the Taliban had never fully defeated. They, in turn, had long dominated the drug traffic in the area of northeastern Afghanistan they controlled in the Taliban years. In the meantime, the CIA also turned to a group of rising Pashtun warlords who had been active as drug smugglers in the southeastern part of the country. As a result, when the Taliban went down, the groundwork had already been laid for the resumption of opium cultivation and the drug trade on a major scale. As a compromise, Washington came to rely on private contractors like DynCorp to train Afghan manual eradication teams. However, by 2005, according to New York Times correspondent Carlotta Gall, that approach had already become “something of a joke.” Two years later, as the Taliban insurgency and opium cultivation both spread in what seemed to be a synergistic fashion, the US Embassy again pressed Kabul to accept the kind of aerial defoliation the United States had sponsored in Colombia. President Hamid Karzai refused, leaving this critical problem unresolved. 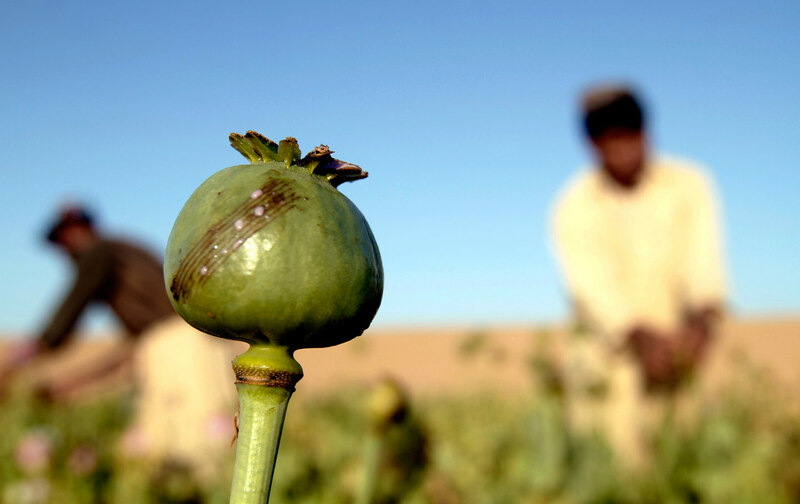 The UN’s “Afghanistan Opium Survey 2007” found that the annual harvest was up 24 percent to a record 8,200 tons, which translated into 53 percent of the country’s GDP and 93 percent of the world’s illicit heroin supply. Significantly, the UN stated that Taliban guerrillas had “started to extract from the drug economy resources for arms, logistics, and militia pay.” A study for the US Institute of Peace concluded that, by 2008, the movement had 50 heroin labs in its territory and controlled 98 percent of the country’s poppy fields. That year, it reportedly collected $425 million in “taxes” levied on opium traffic, and with every harvest, it gained the necessary funds to recruit a new crop of young fighters from the villages. Each of those prospective guerrillas could count on monthly payments of $300, far above the wages they would have made as agricultural laborers. In mid-2008, to contain the spreading insurgency, Washington decided to commit 40,000 more American combat troops to the country, raising allied forces to 70,000. Recognizing the crucial role of opium revenues in Taliban recruitment practices, the US Treasury also formed the Afghan Threat Finance Cell and embedded 60 of its analysts in combat units charged with launching strategic strikes against the drug trade. Using quantitative methods of “social network analysis” and “influence network modeling,” those instant civilian experts would often, according to one veteran analyst, “point to hawala brokers [rural creditors] as critical nodes within an insurgent group’s network,” prompting US combat soldiers to take “kinetic courses of action—quite literally, kicking down the door of the hawala office and shutting down the operation.” Such “highly controversial” acts might “temporarily degrade the financial network of an insurgent group,” but those gains came “at the cost of upsetting an entire village” dependent on the lender for legitimate credit that was the “vast majority of the hawalador’s business.” In this way, once again, support for the Taliban grew. By 2009, the guerrillas were expanding so rapidly that the new Obama administration opted for a “surge” in US troop strength to 102,000 in a bid to cripple the Taliban. After months of rising troop deployments, President Obama’s new war strategy was officially launched on February 13, 2010, in Marja, a remote market town in Helmand Province. As waves of helicopters descended on its outskirts spitting up clouds of dust, hundreds of Marines sprinted through fields of sprouting opium poppies toward the town’s mud-walled compounds. Though their target was the local Taliban guerrillas, the Marines were in fact occupying the capital of the global heroin trade. Forty percent of the world’s illicit opium supply was grown in the surrounding districts and much of that crop was traded in Marja. By attacking the guerrillas but ignoring the opium harvest that funded new insurgents every spring, Obama’s surge soon suffered that defeat foretold. As 2012 ended, the Taliban guerrillas had, according to The New York Times, “weathered the biggest push the American-led coalition is going to make against them.” Amid the rapid drawdown of allied forces to meet President Obama’s December 2014 deadline for “ending” US combat operations, reduced air operations allowed the Taliban to launch mass-formation attacks in the north, northeast, and south, killing record numbers of Afghan army troops and police. In the fighting season of 2015, the Taliban decisively seized the combat initiative and opium seemed ever more deeply embedded in its operations. The New York Times reported that the movement’s new leader, Mullah Akhtar Mansour, was “among the first major Taliban officials to be linked to the drug trade…and later became the Taliban’s main tax collector for the narcotics trade—creating immense profits.” After months of relentless pressure on government forces in three northern provinces, the group’s first major operation under his command was the two-week seizure of the strategic city of Kunduz, which just happened to be located on “the country’s most lucrative drug routes…moving opium from the poppy prolific provinces in the south to Tajikistan…and to Russia and Europe.” Washington felt forced to slam down the brakes on planned further withdrawals of its combat forces. Amid a rushed evacuation of its regional offices in the threatened northern provinces, the UN released a map in October showing that the Taliban had “high” or “extreme” control in more than half the country’s rural districts, including many where they had not previously been a significant presence. Within a month, the Taliban unleashed offensives countrywide that aimed at seizing and holding territory, threatening military bases in northern Faryab Province and encircling entire districts in western Herat. Not surprisingly, the strongest attacks came in the poppy heartland of Helmand Province, where half the country’s opium crop was then grown and, said The New York Times, “the lucrative opium trade made it crucial to the insurgents’ economic designs.” By mid-December, after overrunning checkpoints, winning back much of the province, and setting government security forces back on their heels, the guerrillas came close to capturing that heart of the heroin trade, Marja, the very site of President Obama’s media-saturated surge rollout in 2010. Had US Special Operations forces and the US Air Force not intervened to relieve “demoralized” Afghan forces, the town and the province would undoubtedly have fallen. By early 2016, 14-plus years after Afghanistan was “liberated” by a US invasion, and in a significant reversal of Obama administration drawdown policies, the United States was reportedly dispatching “hundreds” of new US troops in a mini-surge into Helmand Province to shore up the government’s faltering forces and deny the insurgents the “economic prize” of the world’s most productive poppy fields. After a disastrous 2015 fighting season that inflicted what US officials have termed “unsustainable” casualties on the Afghan army and what the UN called the “real horror” of record civilian losses, the long, harsh winter that has settled across the country is offering no respite. As cold and snow slowed combat in the countryside, the Taliban shifted operations to the cities, with five massive bombings in Kabul and other key urban areas in the first week of January, followed by a suicide attack on a police complex in the capital that killed 20 officers. Simultaneously, a recent UN Security Council investigation found that the Taliban has systematically tapped “into the supply chain at each stage of the narcotics trade,” collecting a 10 percent user tax on opium cultivation in Helmand, fighting for control of heroin laboratories, and acting as “the major guarantors for the trafficking of raw opium and heroin out of Afghanistan.” No longer simply taxing the traffic, the Taliban is now so deeply and directly involved that, adds the Times, it “has become difficult to distinguish the group from a dedicated drug cartel.” Whatever the long-term trends might be, for the foreseeable future opium remains deeply entangled with the rural economy, the Taliban insurgency, and government corruption whose sum is the Afghan conundrum. With ample revenues from past bumper crops, the Taliban will undoubtedly be ready for the new fighting season that will come with the start of spring. As snow melts from the mountain slopes and poppy shoots spring from the soil, there will be, as in the past 40 years, a new crop of teenaged recruits ready to fight for the rebel forces. After fifteen years of continuous warfare in Afghanistan, Washington is faced with the same choice it had five years ago when Obama’s generals heli-lifted those Marines into Marja to start its surge. Just as it has been over the past decade and a half, the United States can remain trapped in the same endless cycle, fighting each new crop of village warriors who annually seem to spring fully armed from that country’s poppy fields. At this point, history tells us one thing:In this land sown with dragon’s teeth, there will be a new crop of guerrillas this year, next year, and the year after that. Even in troubled Afghanistan, however, there are alternatives whose sum could potentially slice through this Gordian knot of a policy problem. As a first and fundamental step, maybe it’s time to stop talking about the next sets of boots on the ground and for President Obama to complete his planned troop withdrawal. Next, investing even a small portion of all that misspent military funding in rural Afghanistan could produce economic alternatives for the millions of farmers who depend upon the opium crop for employment. Such money could help rebuild that land’s ruined orchards, ravaged flocks, wasted seed stocks, and wrecked snowmelt irrigation systems that, before these decades of war, sustained a diverse agriculture. If the international community can continue to nudge the country’s dependence on illicit opium down from the current 13 percent of GDP through such sustained rural development, then perhaps Afghanistan will cease to be the planet’s leading narco-state and just maybe that annual cycle can at long last be broken. Alfred McCoyAlfred McCoy is the J.R.W. Smail Professor of History at the University of Wisconsin-Madison. A TomDispatch regular, he is the author of In the Shadows of the American Century: The Rise and Decline of US Global Power and Policing America’s Empire: The United States, the Philippines, and the Rise of the Surveillance State.